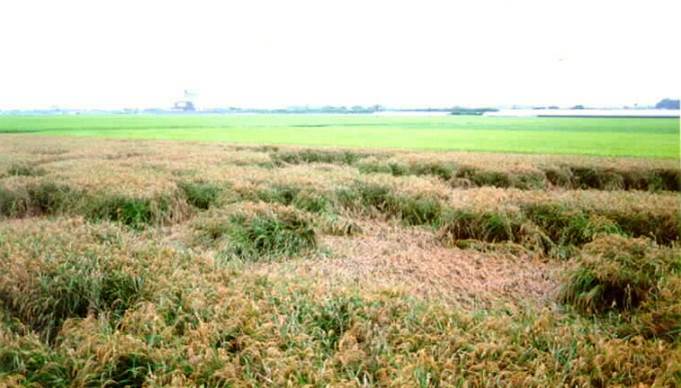 Sheath blight is a disease of rice plants which is caused by a fungus that lives in the soil. When rice fields are flooded, the fungus floats to the top of the water and contacts rice plants; the fungus grows out and moves into the rice leaf. The fungus spreads across the water to adjacent plants. The fungus grows across touching plant parts. The flow of water and nutrients in the rice plant is interrupted and the leaf dies, reducing rice yield. Development of resistant cultivars has been slow, because resistance is linked to undesirable traits such as tall plant stature, late maturity, and poor milling quality. Research has shown that a single application of a fungicide provides almost season-long control of sheath blight. Authors: Shrestha, B. K., et al. Title: Suppression of sheath blight development in rice and sclerotia germination of Rhizoctonia solani by rice-associated strains of Bacillus spp.